Not a bad score for Kung Fu to land legendary punkers SLF for their twelfth studio disc, the simply, and aptly titled Guitar and Drum And that's just what we get - a fundamentally sound, organically grown throwback-molded product that bridges 25 years in a matter of a few barre chords and string bends. It's been about that long since the inspirational old school classic Inflammable Material emerged shortly after the dawning of the UK Punk scene that made heroes of The Pistols, The Damned and The Clash. After a number of well received releases, Nobody's Heroes ('80), Go For It ('81), and highly populated shows, SLF went the way of most from back in the day - they split and sought refuge in soloism - until the end of the decade when they would regroup... regroup, such as it was, significant in that Jake Burns was and continues to be the mainstay for the band. The Kung Fu label, better known for presenting the poppier side of punk and poseurish leanings of today's younger talents as The Vandals, Ataris, etc., gets neither from the surprisingly not-so-grizzled vets, though after one listen it's undeniable as to their degree of influence on many of today's bands, loud rock, pop/punk or otherwise. This fourteen-track foray is the first studio effort in five years for the band, lower profiled, older, and equally as sharp. 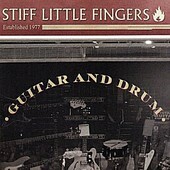 Showcasing flexibility over the fretboard that belies the "stiffness" in their moniker, the band mixes thematics as social awareness, "Can't Get Away With That," and self-preservation, "Still Burning," "Be True To Yourself," to the "Strummerville" ode to Joe, soon-to-be classic, for a solid return delivered with roof blowing appeal, rich acoustics, and sharp hooks.